In the old days (this post will contain a few references to them), you’d send a book to press and a week or so later you’d receive an overnight package containing what was called the blueline. This is a proof of what the printer’s going to start producing thousands of copies of as soon as you give your okay. Blueline appears to be archaic enough at this point that even Wikipedia doesn’t have an entry for it, although it wasn’t that long ago that I reviewed actual bluelines instead of laser proofs, which is the current equivalent. Things have been changing fast in the printing industry. A blueline was produced from the film that would be used to make the book’s printing plates. Unlike architectural bluelines, which have blue backgrounds and white lines, printers’ bluelines had blue type on an off-white background. The paper was slick enough that if you needed to make corrections or annotations, you’d need to use a fine-line permanent marker or a grease pencil. With the evolution of printing technology to what is called "computer to plate" (CTP), or "direct to plate," there is no intermediate film step. Whole highly skilled departments of printing companies (including the strippers, who stripped the film into frames that held the pages in the right positions while the plates were made . . . wow, was that precision work!) ended up doing different types of jobs. This has all happened pretty invisibly to the rest of the world. Bluelines are no longer blue, but the processes of dealing with the proofs at this stage of the printing process remain the same and are still critically important. The blueline, oops proof, arrives via overnight FedEx. Ideally, the printer has told you when to expect it but in reality you usually just estimate when it will appear and stay ready to drop everything. This is the blueline (PROOF!) 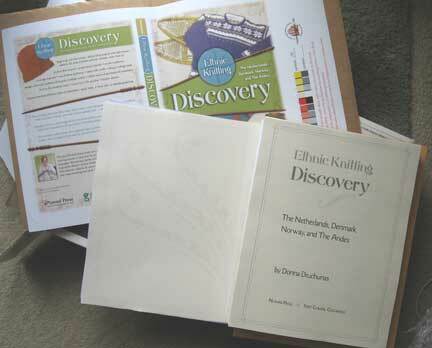 of Ethnic Knitting Discovery that landed on my front doorstep on Friday. Printers vary in how they package their proofs. This printer uses heavyweight plastic wrap to keep the proofs bundled together and safe inside the cardboard box. Inside that wrap is everything we sent them to produce the book along with everything they’ve generated from which they will print it. Our materials being returned include CDs, laser proofs, and, in the old days, photos that the printer would have scanned and stripped into the film at the right sizes and in the right locations . . . or so one hopes . . . "right" is one of the things that’s checked at this proofing stage. Their materials included for us to check consist of a proof of the cover and a proof set of pages, not trimmed to size but ideally in the correct order and with all of their elements present and in the correct format. We sent away a small FedEx box. At this point, we get back a large FedEx box. I hope that’s legible. 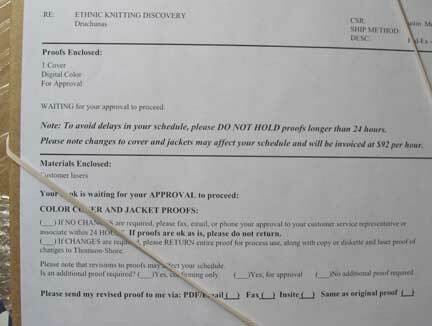 The gist is that the job is being HELD until the two pieces of paper are returned, with signatures, to the printer. The normal schedule is this: proof arrives; drop everything and check it; return approval to the printer within 24 hours. 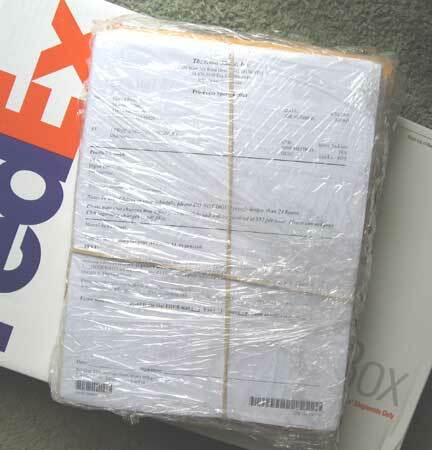 Ideally, you check the proofs and get them back in overnight FedEx the same day you got them . . . and certainly no later than the next day. Thus the whole proof-approval process should go start-to-finish, door-to-door, printer-to-publisher-to-printer, within 48 or no more than 72 hours. In the old days, we returned all the materials in the box to the printer to use as references when printing the job. In these new days, we don’t need to physically return anything if there are no changes. In that case, we can fax in our approval forms. If there are only a few changes, we can drop a new single-page PDF or two on an FTP site, or even e-mail them if the files are small enough. Once you’ve signed off on the approval form, you have to live with any errors that were in the proof that show up in the finished books. Changes at this stage are expensive, so you make any changes that are truly important but the book should definitely have already been well proofed multiple times before it reaches this step in the process. You should mostly be looking for printers’ errors. Since we started sending books to press in PDF format instead of as what were called boards (skipping a long digression here), there are fewer errors because the printers no longer need to strip as many things into position (which introduced lots of opportunities for them to be out of position). You check the pages and the cover proof for everything. You check them on their own, you proofread everything on the cover again (even though you’ve seen this stuff too many times), and you check them all against the laser pages you sent to the printer. And then you check them again. You do this fast and thoroughly. And then you sign the papers, add—if necessary—a list of the pages with changes and what those pages are (mark changes on pages, too: redundancy of notification is good), and send the stuff back. You’ve released the proofs, given your approval, and it’s done. By the way, on this set of proofs I still haven’t seen the second color on the text, because there’s no economical way to proof a two-color job. For example, I opened the title-page spread of the proofs and thought, "Gee, those leaf forms would be really nice in green . . . I missed an opportunity to make this book look even better because I didn’t make them green. . . ." Well, I did make them green! The color just doesn’t show on this proof, although the proof’s on paper that’s closer to what the real paper will be than any I’ve seen so far. Cover proofs are notoriously approximate because there’s no economical and accurate way to proof color printing, although if you work with a single proofing system for a while you get to the point where you can guess approximately which aspects of the proof are "off" and can therefore guess whether what you’re seeing is good enough. Of course, as soon as you fax in your forms or drop the return box in FedEx you discover an (or "another") error. Possibly an author writes to say that there is a mistake on page such-and-such which everyone has missed for the last two years. When you go look at the page, maybe it turns out the author is simply nervous and is reading the formula wrong and it’s really okay. Possibly someone who has an advance reading copy (ARC) calls to mention that on page 107 of that version of the book two of the charts are missing their titles. That last one actually happened yesterday on this book. I went to look at the newly approved proofs and the yep, the titles were missing from the lower two of the three charts on what was about to become the real book, as well as the ARC. I looked at the laser proofs that we had sent to the printer and yep, the titles were missing there, too. That’s why we keep all these copies and keep them together: to track down the point at which things went awry. At proofing stage, though, you don’t worry yet about WHY. You pay attention to FIX IT, if possible. Because we have a crackerjack proofreader who wouldn’t normally miss this sort of thing (or a gazillion others), I pulled the proofing pages out of the archive box and looked at page 107. All appropriate chart titles were in the correct locations when the pages were proofed. I’m convinced that there are gremlins who come add glitches to printing materials after they have been checked until everyone’s blue in the face and are, truly, perfect. From proofreading forward, I open the files as infrequently as possible and make as few changes as I can in order to keep the gremlins from doing more than a minimal amount of mischief. So when you’ve done the best job you humanly can, you let go. And start thinking about where the heck you’re going to put another pile of boxes in the garage. Speaking of which, the fifth print run of Arctic Lace shipped from its printer last Thursday and may appear as early as tomorrow and right now there’s no room for another thirty cartons in the garage (sixty more are going to the distributors). The freight company’s supposed to call ahead, but we usually only know we’re about to get a delivery when the truck pulls up in front of the house. And in about three weeks, we’ll also have thirty or so more cartons of Ethnic Knitting Discovery to find room for (again, the bulk of the run goes to the distributors). I can tell what I’ll be doing with the rest of this Labor Day: moving and re-stacking the existing boxes to make room for another few thousand pounds of books. I find the process you have gone through with your book very interesting. Thank you for sharing. It makes me more aware of the work involved. I will be less critical of errors found in knitting books. Thanks for your notes! I’m critical of errors found in knitting books, but I don’t start criticizing unless I think the gremlins were given a key to the computer (sometimes happens). And it takes a LOOOONG time to publish a book. Even when you work on it for hours every day. Some publishers drink a lot. I try to make mine tea, though. I need to keep my wits about me to keep the error-gremlins from sneaking in even more often than they do when I’m totally vigilant. Hmm, writing a thesis was tough enough! So was getting a scientific paper published. Publishing a book sounds totally scary! At least papers are read by very few and theses by even fewer. Books are read by people like me to pounce on every typo or grammatical error! Deb, it’s such a relief to see *you* writing about the gremlins. I am in terror of those kind people who are so adept at finding every typo and grammatical error. When I was preparing my (self published) book I was in tremendous fear of the mistakes that would inevitably find their way into the final product. Yes, they’re there, and the mysteriously perfect readers keep finding them, but I force myself to be gracious about it. FWIW, my printer, Snohomish Publishing still produces real film and sent me bluelines. I marked them with a fine point sharpie. For all the good it did me. Looking forward to meeting you at the conference in October.